PlastiCell manufactures honeycomb using Victrex APTIV™ film, facing it with Victrex PEEK™ copolymer. The core can be thermoformed into the desired shape. Corecork can withstand processing temperatures up to 150°C (302°F) and is available in several densities, tailored to specific performance levels. Amorim Corecork was used in the sandwich construction of this kayak. The material exhibits low water absorption and low resin uptake. EconCore is 100% bio-based honeycomb made with PLA in an automated continuous process that produces the material very cost effectively. 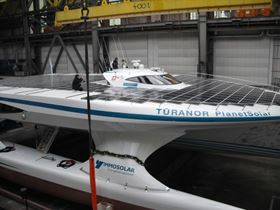 Turanor Planet Solar was constructed with sandwich composites incorporating carbon skins and high-density Airex C70 foam core in various densities. AIREX® T92 is a PET foam core developed as an environmentally friendly, less brittle PET product with enhanced mechanical properties. ArmaFORM PET foam from Armacell is said to exhibit high-temperature resistance, able to withstand curing temperatures of up to 180°C (356°F). Z-Plex conformable foam core from 3Tex features integral skins woven together with Z-axis columns to enclose closed-cell foam components. Z-Plex core material is flexible enough to form deep bends and curves as shown in this sink structure. The composites industry has long known that the strength and stiffness of a composite structure can be increased significantly with little additional weight by laminating a core material between two skins. The core of the sandwich serves to distribute shear stresses from loads over a wider area and resist shear and compressive forces better than a single-faced laminate. Innovative core materials which have proven successful include thermoformable honeycomb, conformable foam and agglomerated cork. These materials can be easily shaped to produce curves and fit into moulds. Recycled polyethylene terephthalate (PET) bottles and carpeting are being used to produce cores that can lower the cost of composite structures. And renewable bio-based polymers are well aligned with new green classifications. Portugal-based Amorim Cork Composites has developed a range of natural and sustainable Corecork® products for sandwich structures that are said to offer excellent fire, smoke and toxicity properties with good mechanical and processing characteristics. The material exhibits low water absorption and low resin uptake, which can lead to reduced resin consumption and weight savings. In addition, cork provides vibration damping and sound attenuation properties in sandwich composite structures, the company relates. Corecork, which can withstand processing temperatures up to 150°C (302°F), is available in several densities, tailored to specific performance levels. The low density of the material, its flexibility and conformability enable the integration of Corecork into fast production cycles, notes Amorim. Comparative data measured on sandwich panels show that Corecork meets or exceeds the performance of similar fibre reinforced plastic (FRP) panels made with synthetic cores, the company adds. Amorim cork was used in an award-winning project completed by a Danish architectural firm. 3XN architects won a 2010 JEC Innovation Award in the Environment & Recycling category for a green structure made with sustainable and intelligent materials during a Copenhagen climate conference. The project incorporated sandwich composites produced using bio-based and reusable materials. Sheets of cork served as the core, while the outer facings were made from flax fibres in a soybean-based resin. A new core material from Swedish supplier DIAB recently joined the Divinycell family of structural cores. Matrix 7-7 foam core is said to provide low weight and good mechanical properties, making it well suited for marine applications and wind turbine blades and nacelles in particular, relates DIAB. 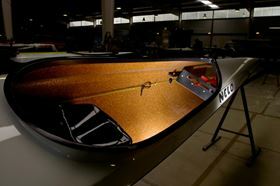 The company adds that the material is probably the lightest, commercially available foam core to meet accepted marine deck standards. With a nominal density of only 3.2 lb/ft3, Divinycell Matrix 7-7 meets the minimum requirements for core materials in the most important classification societies, such as DNV (compression strength 87 psi and shear strength 73 psi). It was designed to enable boat designers to significantly decrease deck weight. A low viscosity core bonding adhesive, Divilette, has been formulated specifically for use with DIAB core materials. It is a polyester resin based product containing lightweight microspheres and fillers. Superstructures for a series of 24 m (80 ft) aluminium ferry boats were made of sandwich composites using Divinycell H foam as the core. This material is said to offer the highest strength to density ratio in its application range. Each superstructure consists of four parts (deck, roof, cabin and structural roof girder). The components were supplied as modules, which were produced by Core Infusion™ moulding with a combination of E-glass and carbon reinforcements over a Divinycell H core. Fitting cored FRP superstructures to steel and aluminium hulls is a growing trend aimed at reducing topside weight, while benefiting from other advantages of composites, DIAB relates (see box.) Divinycell H is available in a broad range of densities of 38-250 kg/m3, enabling designers to optimise structures by selecting the best density for each application. DIAB is a partner in a joint venture which has developed a Composite Superstructure Concept® to improve marine transportation through the use of lightweight structures. The high strength, lightweight sandwich composite construction system has been shown to produce significant weight savings, increased payloads, built-in thermal insulation, reduced fuel consumption and increased stability for vessels. In addition, the FRP superstructure will not rust, rot or corrode, while providing a lower total-life cost, DIAB observes. DIAB is also a leading supplier of core materials for wind turbine blades, supplying products in kit form, with each part numbered and fully dimensioned and ready for positioning into the mould without the need for trimming. The wind energy industry also uses lightweight sandwich composites for turbine spinners and housings, resulting in reduced transport and installation costs as well as high levels of noise insulation. Core materials in kit form for boat building are available from SP - High Modulus, the marine business unit of Gurit. The B3 SmartPak is hailed by the company as an engineered construction solution, making boat building easier and more cost-effective. It is a complete package of reinforcements and Corecell™ styrene acrylonitrile (SAN) based structural foam core materials, as well as construction plans and drawings. The B3 SmartPak arrives complete with all the reinforcements and core materials required for the job, pre-cut to the exact size and shape required to fit the mould. The materials are packed in boxes in the order of assembly and are accompanied by comprehensive schematics and a construction manual. A process defined for the builder and integral quality control systems are also included. Optionally, the kits can be ordered with laminate specifications optimised for production and performance, processing strategies for individual projects, plus epoxy resins and laminated composite panels with shapes machined for the build. The SP - High Modulus range of Corecell foam core is said to be well suited for marine applications, offering high toughness and impact resistance characteristics. 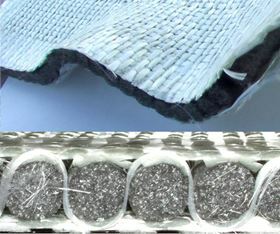 The foam acts as a shock absorber between the two skins of a sandwich structure, distributing stresses evenly within the core, explains the manufacturer. The latest addition to the core range is Corecell M-Foam for marine applications, exhibiting a combination of high shear strength with low density, high elongation, high-temperature resistance and low resin uptake. Gurit has developed G-PET recyclable structural foam core material, targeting the wind energy market. G-PET is produced using a highly efficient manufacturing process with cost-effective recycled raw materials that had previous lives as plastic drink bottles and textile fibres. An automatic, high-yield extrusion process converts the materials into a consistent product that offers low resin uptake compared to balsa wood, explains Gurit. 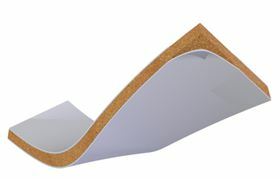 Plus, G-PET foam core is not subject to the same fluctuations of supply and demand as balsa, the company notes. Another supplier of PET foam is Armacell, headquartered in Germany, which offers a wide range of ArmaFORM PET foams for sandwich composites. A 'green' formulation is produced from recycled PET drink bottles. Another product is recently introduced ArmaFORM PET AC 115, which the company says offers enhanced properties compared with its predecessor ArmaFORM PET 100. The shear elongation and, therefore, the damage tolerance and flexibility of the newer product have been improved by 10-20%, while maintaining the same compression modulus, relates Armacell. ArmaForm PET AC is manufactured in densities of 80, 100, 115 and 135 kg/m3. ArmaFORM PET AC 80 was developed as a direct competitor to polyvinyl chloride (PVC) core foams, notes Armacell. ArmaFORM PET foams exhibit high-temperature resistance and can withstand short-term curing temperatures of up to 180°C (356°F). They are recyclable, provide good fatigue resistance and produce no toxic gases when burned. Alcan Composites, the Swiss manufacturer of structural core materials, recently changed its name to 3A Composites Core Materials. The company will continue to offer the BALTEK balsa and AIREX PVC, PET and fibre-reinforced polyurethane (PU) foam core product lines. The latest foam core addition is AIREX® T92, a PET foam core developed to meet the needs of customers who want a less brittle PET product with enhanced mechanical properties and is environmentally friendly. T92 is said to offer improved damage tolerance and excellent fatigue resistance. The natural blowing agent carbon dioxide (CO2) used during production and a share of recycled content make it an ecological product, notes the company. BALTEK balsa was used in a novel composite bridge deck project that replaced steel grid decking in Louisiana, USA. The project, installed last September, was the subject of an award-winning technical paper at the ACMA’s Composites 2010 exposition and convention. To construct the 7.6 m (25 ft.) span, high-density, end-grain balsa core strips were wrapped longitudinally with biaxial E-glass fabric and reinforced on the top and bottom with unidirectional tyre cord in both the traffic and transverse directions. Vacuum infusion processing of the dry-placed assembly with vinyl ester resin resulted in a composite monolith with tightly controlled dimensions and performance equal to or greater than the steel grid deck that it replaced, according to the paper’s authors. Curved sandwich composite parts that are difficult to produce using balsa or rigid foam are easy with flexible, conformable cores. A conformable fibre-reinforced foam core designed for closed moulding is available from Ohio, USA-based WebCore Technologies. TYCOR® W was specifically designed as a high-performance alternative to balsa and other foam cores in wind turbine blade construction. It can reduce total cost and weight for utility-scale wind turbine blade production, relates WebCore. A 1 inch (2.54 cm) thick TYCORE W core is said to save an average of 0.5 lb (.227 kg) per 1 ft2 (929 cm2) when compared to balsa of the same thickness. The technology combines fibreglass and closed-cell foam in an engineered architecture to meet required design loads. The unique internal fibre structure facilitates resin penetration, a performance advantage that reduces resin usage while providing controlled infusion during moulding, explains WebCore. The core is said to be more durable than other conformable products on the market. The flexibility of the material enables blade designers and manufacturers to tailor individual blade and turbine specifications easily. Another conformable core product is Z-Plex™, manufactured by North Carolina, USA-based 3Tex. The Conformable Total Sandwich System provides structural skins and thousands of slender, compliant closed-cell foam cores, which are tied together by fibre Z-axis columns – all woven together in a single step to form a core with integral skins up to 1 inch thick. The many independent flexible foam cores provide the conformability. Spaces between the cores enable resin flow in vacuum infusion. Once cured, the Z columns become rigid, taking all of the loads instead of the foam while eliminating the possibility of delamination, explains 3Tex. A new 100% bio-based hexagonal honeycomb core has been developed by EconCore of Belgium. The process uses patented ThermHex technology in an automated continuous production of honeycombs from polylactic acid (PLA) bio-polymer. Only moments after the honeycomb core is made, skins are added in a second step. Skins can be unfilled PLA or PLA reinforced with consolidated flax. Targeted applications for the sandwich panels made of the bio-based core include reusable packaging, furniture, automotive interiors, separation walls and other structural panels. An innovative boat building project at the HDW shipyard in Kiel, Germany, produced an extremely light carbon sandwich-design catamaran, incorporating AIREX® C70 foam core in various densities, increasing the strength and stiffness of the structure while optimising weight. Besides material choice, the laminate schedule was designed for the lightest weight. The craft was launched in March 2010 after 68 000 hours of intensive work spanning 15 months. The centre hull shell of the 30 m (98.4 ft) long, 15 m (49.2 ft) wide Turanor Planet Solar consists of a sandwich of 4 mm (0.16 in.) carbon skins (double bias and unidirectional) and 50 mm (1.97 in.) C70.130 high-density core material. The skin/core thickness ratio combined with high strength and stiffness core material produced a hull capable of absorbing high pounding loads encountered on the high seas, relates Airex AG, a unit of Alcan Composites Core Materials, now 3A Composites Core Materials. A key consideration when designing the catamaran was the weight of 825 solar panels covering the deck. The sub-construction of the solar panels is a sandwich structure made of AIREX C70 foam core, as well. The owners intend to sail the craft around the world, taking about 160 days to go 50 000 km. The technology, which EconCore offers to licensees, enables the production of bio-based sandwich panels with excellent mechanical properties that are cost-competitive with traditional sheet materials, the company relates. EconCore also produces honeycomb cores from polypropylene (PP), PET, PCS and polyphenylene sulphide (PPS) in thicknesses of 4 mm (0.16 inch) to 30 mm (1.18 inch) in various densities. 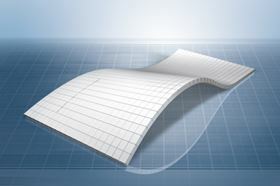 Paper honeycombs are produced from corrugated sheets with its TorHex automated technology. Volume production of TorHex cores in thicknesses of 4-15 mm (0.59 inches) at high production speeds is especially economical, the company notes. PlastiCell of France uses Victrex APTIV™ film in an innovative process to produce thermoplastic honeycomb. The core material can be thermoformed into the desired shape in combination with fibre-reinforced Victrex PEEK™ polymer composite skins to create structural parts without the use of adhesives, according to Victrex. Thin APTIV film sheets are formed into semi-hexagonal shapes, then stacked and laser welded together. Preformed, pre-heated composite skins are press-moulded onto the honeycomb in a forming tool, eliminating the need for adhesives. The combination of the pressure inside the mould and the temperature of the mating surfaces cause the honeycomb core to conform to the mould geometry, while ensuring excellent bonding between the core and skins, explains Victrex. The honeycomb product is well suited for lightweight structures operating in aggressive environments, including extreme variations in temperature and humidity, chemical and sea water exposure and intense vibrations, the company adds. 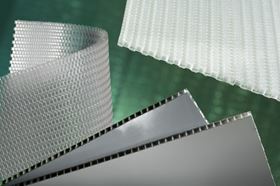 Hexcel Corporation, based in Connecticut, USA, recently introduced an aluminium version of its HexWeb® Acousti-Cap, which is the company’s broadband sound-reducing honeycomb. It consists of a permeable cap material embedded into a honeycomb to create an acoustic septum. 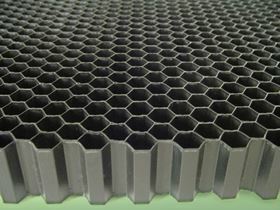 Customers specify desired flow resistance characteristics, overall core thickness, number of caps in a cell and insertion depth, producing a honeycomb tuned to precise acoustic requirements. The aluminium product provides comparable performance with added cost-saving benefits, relates Hexcel. It can withstand temperatures up to 175°C (350°F) during fabrication. Acousti-Cap sound-reducing honeycomb is complemented by Hexcel’s Acousti-core® products for sound reduction in aircraft interiors. Acousti-Core is a range of lightweight core products in which the honeycomb cells are uniformly filled with sound-absorbing fibreglass batting. This results in minimal weight increase and unchanged mechanical properties, plus excellent acoustical absorption properties, high structural strength, high resistance to heat transfer with metallic core and low smoke emission, explains Hexcel. Other leading suppliers of core materials for composite structures include Tricel Honeycomb Corp, based in Illinois, USA, and Nida-Core Corp in Florida, USA. Tricel manufactures cost-effective kraft paper honeycomb in a wide range of specifications. The honeycomb is available as a phenolic impregnated product for structural applications. Nida-Core also offers honeycomb core made of a proprietary polyurethane copolymer, in addition to NidaFoam PET foam and other foam core materials, along with BalsaLite end-grain balsa. 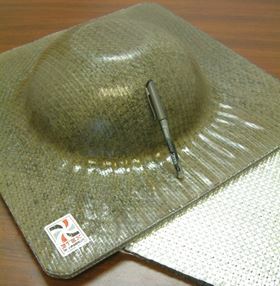 Rhinokore Composites of British Columbia, Canada, manufactures Rhinokore, a tough material that combines honeycomb and foam. A proprietary honeycomb manufacturing technology fuses a low-density polyurethane foam into a honeycomb structure to improve the material’s physical properties significantly. The foam acts as a stabiliser, filling the cells and preventing the honeycomb from buckling under stress, relates the manufacturer. Compmillennia, a North Carolina, USA, builder of composite structures for large yachts, has produced what is considered the largest composite yacht superstructure ever built, attaching it to a 460 ft (140 m) steel-hulled gigayacht. Over 100 000 ft2 (9290 m2) of foam-cored, epoxy-infused composite panels, beams and other FRP structures were assembled on site to form the main deck and top two decks of the yacht. Each structure type required a different flow-map analysis to determine how to best infuse the panels for complete wet-out and optimum properties, relates Compmillennia. At the very top of the superstructure is a 40 ft (12.19 m) x 80 ft (24.38 m) helicopter deck, constructed with panels of carbon fibre skins over Diab’s Divinycell foam core. The face skins are connected through the core by trapezoidal carbon fibre shear webs to handle landing loads. The sandwich is then infused with epoxy resin to form a single integrated structure. According to the builder, the design process achieved the required strength at the lowest possible weight. It demonstrates how composites can be used to produce large structures with technically demanding specifications in a cost-effective manner. The programme required over 3000 ft (915 m) of carbon fibre prepreg longitudinal beams and other high-load carrying beams, incorporating sandwich construction using multiple-ply buildup and dropoff configurations. The structural deck beams required extremely straight fibre alignment throughout corners and over 110 ft (33.5 m) spans in order to meet the load requirements. The superstructure is thought to be the first of such magnitude to use epoxy resin. 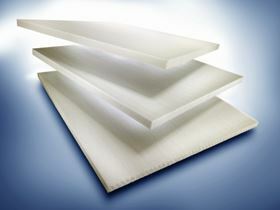 Milliken & Company, based in South Carolina, USA, offers Nexcore®, a fibre-reinforced foam core for resin infused sandwich structures, and Tegris®, a 100% polypropylene composite for hard armour and other applications where improved impact resistance and reduced weight are key objectives. Another USA-based manufacturer is Plascore, in Michigan, specialising in honeycomb cores and composite panels from a wide selection of materials. In addition, Elliott Company of Indianapolis, USA, manufactures ELFOAM® rigid polyuiso/polyurethane foam core materials in blocks, sheets and fabricated shapes in a range of densities. In the Netherlands, Parabeam BV manufactures 3D Glass Fabrics for composite structures. The product is a woven fabric of two deck layers bonded together by vertical piles, which form an integral sandwich structure. When impregnated with a thermoset resin, the fabric absorbs the resin; however, due to the capillary forces of the piles, the fabric rises to its preset height, producing a lightweight, strong sandwich laminate, Parabeam explains. Carbon foam called GraFoam® is available from Graftech International as a core material for multi-layer composite structures and sandwich panels requiring exceptional stiffness and strength. The open-cell, rigid carbon-based material is available in six grades in densities ranging from 32 kg/m3 to 560 kg/m3. Applications include doors, walls, ceiling panels and flooring for buildings, vessels and military applications. GraFoam provides a multi-hour ASTM fire rating with no flame spread or off-gassing, reports Graftech. This feature was published in the July/August 2010 issue of Reinforced Plastics magazine. If you would like further information about any of the issues covered in this feature please e-mail us. EconCore NV and DuPont have joined forces to make strong, high-temperature resistant honeycomb panels. 3A Composites Core Materials says that it has developed a new foam core platform for lightweight, high-volume automotive applications. Hexcel reports that its HiMax glass fiber fabrics were selected to make its Composite Modular Transportable Hangar (CMTH).